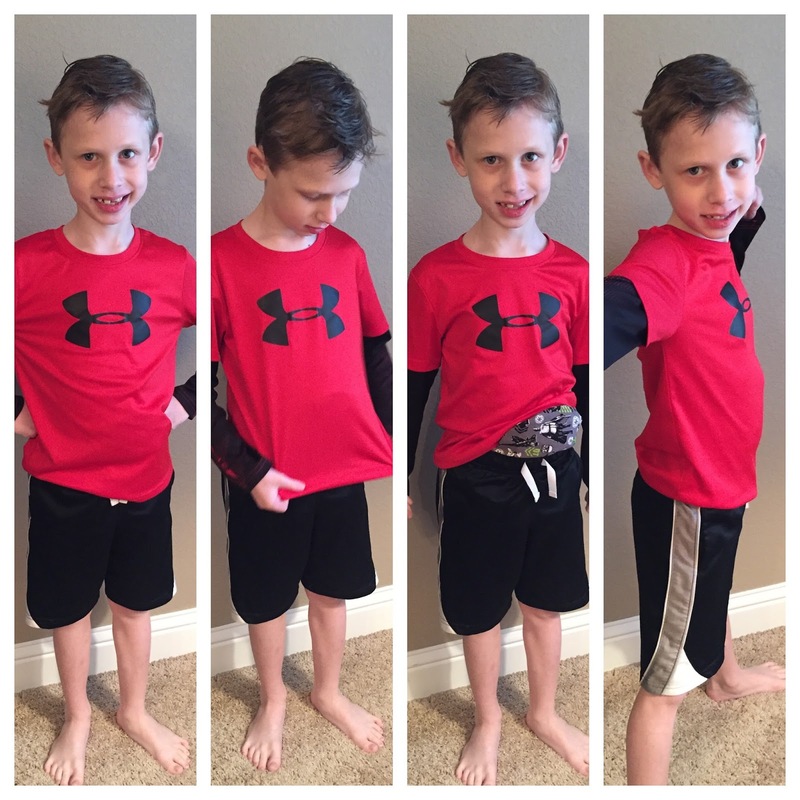 Bennett Brinson Gamel: Fighting Cystic Fibrosis: How is Bennett doing with his colostomy? How is Bennett doing with his colostomy? We're just over 3 weeks in of Bennett having a colostomy. So, I thought I would share with how he (and our family) are adjusting to this new normal. It took Bennett several weeks to become comfortable with his "ostomy" (his preferred word for it). He would talk about it but he didn't want to look at it. He still doesn't like looking at it, but it seems more tolerable now. Colostomies are typically emptied a handful of times throughout the day. So, it's hard to ignore it for too long. Bennett doesn't really mind if people know he has one, but he is protective to not show them what it looks like, for fear that they wouldn't want to see something gross. This may be a good thing considering all privacy goes out the window when you have a little sister. When a babysitter recently walked in the front door to babysit, Avonlea immediately began sharing that Bennett has "a bag right 'here' that the poop goes in." It was really funny to listen to our 3 year old explain Bennett's colostomy. She definitely understands how it works. One interesting fact is colostomies makes noise. Well, to be more accurate, stomas makes noise - when gas passes through. Stomas are the name for the part of the intestines that sticks outside the body. Bennett's stoma making noise is just one part of the experience that Bennett truly doesn't have control over. Gas noises from his stoma is the deadest give away in public that he has a colostomy. I am always very conscious not to make a big deal about it or even acknowledge it when it happens as it is certainly not his fault. But, tonight, during family movie night, his colostomy made a lot of noise. As usual, I didn't respond. But in the dark he piped up and said, "well, that's a cool party trick." It's great to see Bennett try to do his best to accommodate his new reality. I can tell he's really trying to hard to be ok with it. But, there's no doubt, he hates it and wishes it wasn't there. 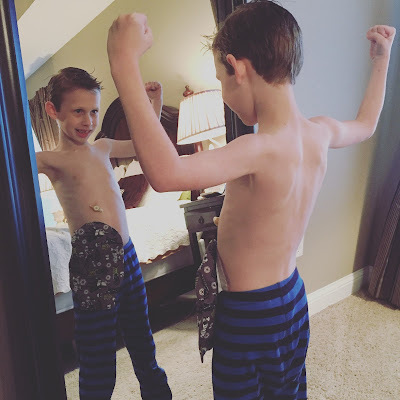 Tonight, I heard Bennett lament about his colostomy, "I wish I was normal..."
Most kids hate having band-aids pulled off - so one can imagine what it's like for Bennett when we have to pull of his colostomy bag, essentially a massive round "band-aid" attached to his abdomen. He doesn't enjoy that at all. He also doesn't like to see his stoma. 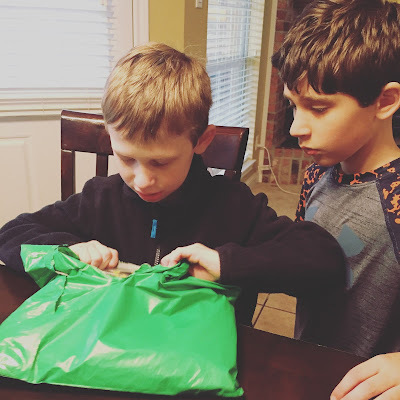 But the hardest parts of Bennett having a colostomy right now is that he can't jump at the Trampoline Park with his friends during Spring Break and, since the colostomy makes him no longer independent with his elimination needs, he can't go to school or on playdates without a parent nearby. That is very disappointing for him and for me. Bennett and I both tend to try to distract ourselves during the caring-for-the-colostomy process. There are times when both of us are frustrated. Neither of us like having to be huddled around the toilet emptying his bag. We both tend to delay the process until we can't anymore. But we both remind ourselves that neither of us chose this and we are thankful for each other in spite of it. I have shared with Bennett how proud of him I am and how sad I am this is where we are. He has shared with me how thankful he is that I choose to help him and that he knows that I love him alot. The other day, Bennett burst in to tears. I had just told him it was time for us to change his colostomy bag. 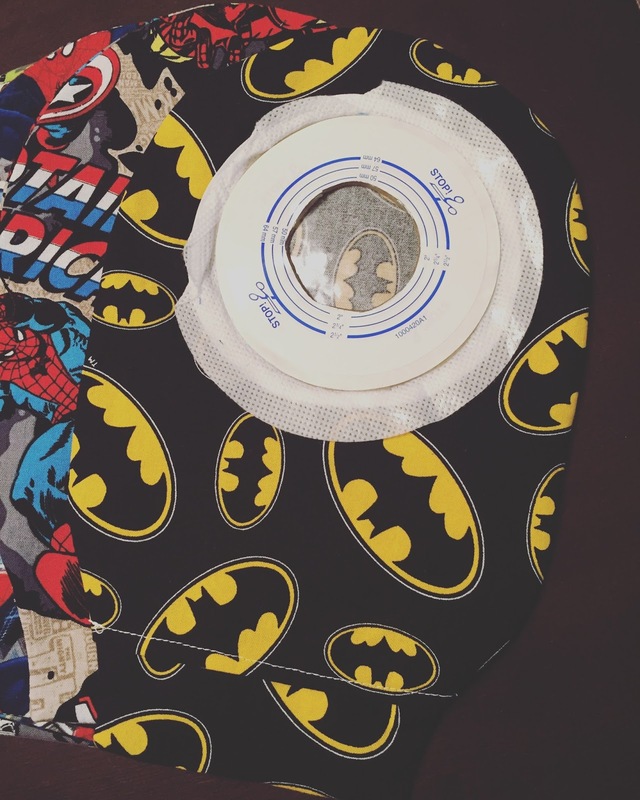 (Bennett's colostomy bag has to be replaced every two days and we typically coordinate it with a nightly shower.) The tears came partly from his not wanting to take a shower but mainly from his dread of the colostomy bag-changing process. It may be hard to see his puffy eyes in this picture but I snapped this picture shortly after he broke down. 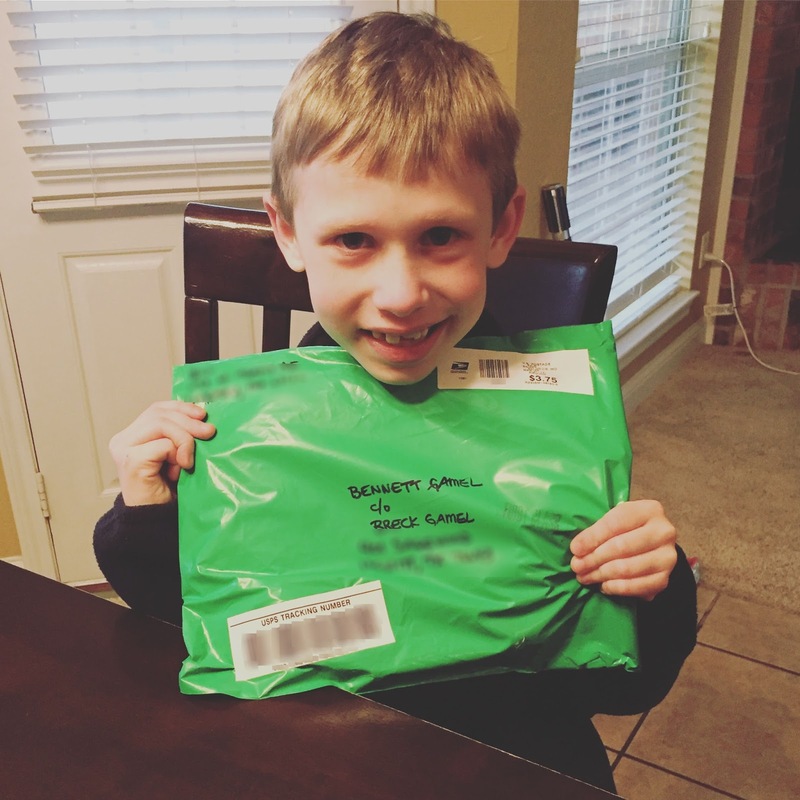 His smile is because I told him he could open the package that had arrived in the mail earlier that day as it had something inside created specifically for him to cheer him up and something specifically with his colostomy in mind. The anticipation was fun for everyone. The package was from my sweet friend and Kappa Delta sorority sister, Karen, who is the designer and owner of Olive + Peony, a small, handmade children's clothing boutique based in St. Louis, Missouri. ...in every fun fabric Bennett could love!!! 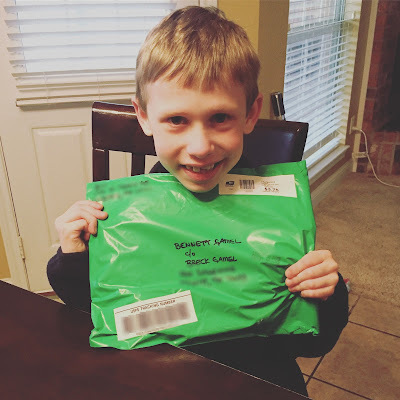 Inside the green package, Bennett found Batman covers and Spiderman covers and Star Wars covers and lego/Robot covers! Covers galore! The covers made specifically for Bennett made our putting on a new colostomy that evening a lot of fun! 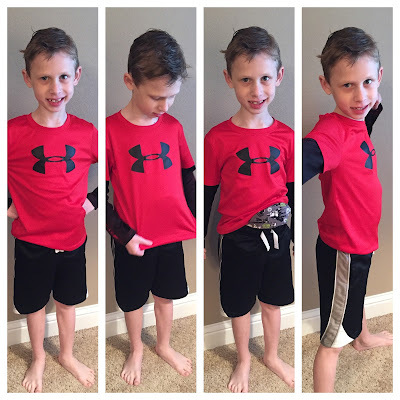 After his shower, Bennett wanted to try on his new colostomy cover with clothes to see how it fit. The cover he wanted to choose first?! The Star Wars one! I am SO very grateful to Karen for her kindness - for the donation of her time, energy and materials - just to help make Bennett's colostomy a little less scary. She definitely accomplished that. He has absolutely loved them. He said that next morning, "I like to look down at my ostomy now. I think I'm going to see my bag but now I just see Star Wars!" 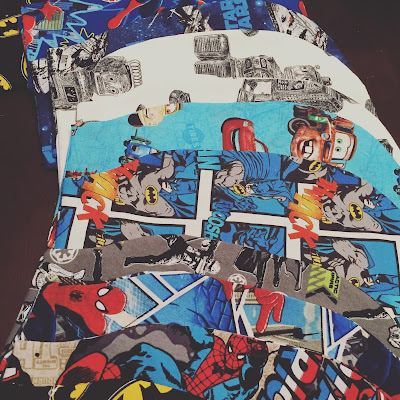 Karen makes beautiful clothing for little girls and boys, not colostomy bags. But she saw a little boy who could be blessed by her handiwork. I am so thankful to her for thoughtfulness! "It's miserable and magical" as Taylor Swift sings in her song "22". That's how most of CF feels like. Thank you, Karen, for bringing the magical.